The xAPI events are made available externally and also used by H5P internally. 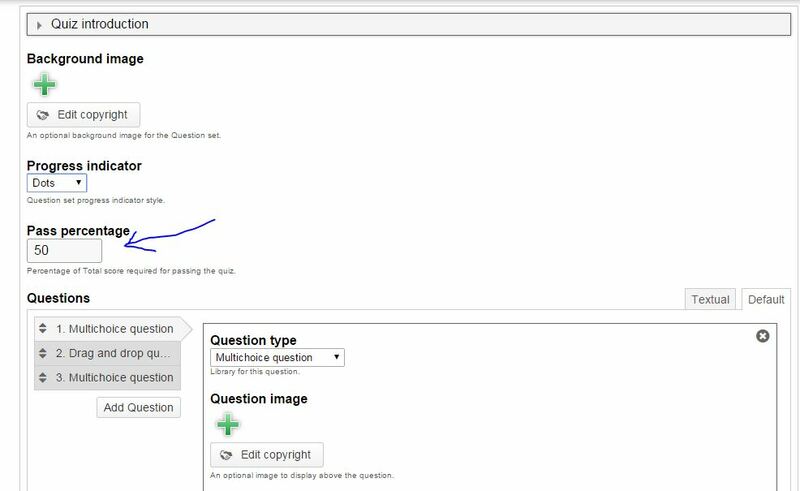 It is used between interactive video and the questiontypes for the interactivities and to calculate total scores, it is used by Questionset to know when a question has been attempted and by H5P core to store the total scores in the database. Implement a facebook like feed "James attempted the US Presidents Quiz" - "James completed the US Presidents Quiz with 45 out of 47 points!" And she'll get all the events generated by H5P and may choose to store them, act upon them or just pass them along to another system. What do you think we should do next with our xAPI integration? Add integrations for popular LRSs like Learning Locker and Scorm Cloud? Add more data to our current statements like the users answers to a question? Noted! Thanks for reporting :) The success field probably will require settings for what score the user must obtain to achieve success, or do you think we could hard code it to 70 % or something? I'm fairly certain that if you could somehow deliver a way for people to use powerpoints as starting point and then enchace content drawn from them, you would have potentially huge audience to catch. ISpring seems to be leader currently (?) in turning powerpoints to html5 and we are currently testing using "snippets" converted from powerpoint files by their software to html5 format and in between of those using exercises powered by h5p. If this process could be done any easier, that would be great - while powerpoint has its limitations, educators in all kind of organisations from universities to big companies have huge amount of material in them. Not to be rude mmikko but how is this relevant to xAPI? I'm not sure, but couldn't xAPI be used to deliver information about powerpoint events (like "the slideshow has ended" or "the slideshow is on page X")? This integration would be a great step forward as far as reporting is concerned. We are currently looking into it. Anyway we can help ? Our current strategy is to make xAPI statements available for the publishing platform. A Learning Locker integration would then be a separate module for that platform that listens for the xAPI statements and sends them to learning locker. If you could create such a Drupal module or Wordpress plugin you would help us out a lot! I am interested in helping on the Drupal die. We evaluated h5p and want to use it in an ongoing project, using both Drupal and Learning Locker as LRS. How can we get this thing running? How are you planning on making the statements available for the platform? The statement itself will be in event.data.statement. The xAPI event also has some helper functions. Do you know of anyone who is currently creating a Wordpress plugin that can handle the xAPI calls from H5P? We're working with http://www.nextsoftwaresolutions.com/grassblade-xapi-companion/ now so hopefully their plugin will soon be able to handle H5P! That's excellent news. Next Software are doing really good work in this area. Hi! Any updates with next software being able to read and store h5p content? Thank you! Great to hear that you are continuing to build on the xAPI functionality. We are sending xAPI statments to LL and are noticing that the output of the responses in the Learning Locker report is not in a useful format. Is there a way to "translate" those answer values into a more human readable format? Hi! Have you tried making visualizations out of the responses? The data is not 'meant' to be very human readable but rather contain enough information for reports to be generated. No - we have not tried building dashboards in Learning Locker. We were hoping just to parse the answers into the .csv extract to start, similar to the solution detailed here (VLookup of the ID info from the tincan.xml file generated by Storyline export). Not very helpful. We can see in the interaction details in LL what each of these values maps to but I'm hoping to get this somehow w/out building custom APIs or reports as our technical knowledge in working w/ these types of reports is very limited at the moment. "en-US": " \n\nTake a look back at the readings. Which of the fo..."
"en-US": "\u00a0\n\nTake a look back at the readings. Which of the following does Hobbes NOT discuss as an example of \"instrumental power?\"\n\u00a0\n"
"en-US": "Reputation for having power\n"
"en": " | Hobbes and Power II"
So the 'correctResponsePattern' is a comma seperated array of the correct responses according to the ids specified further down in the field. In this case it seems like all the answers are correct. but only 2 and 3 are correct. The correct response pattern would be 2[,]3.
for a bit more information about how the xAPI data is built up for MultiChoice. It is possible to parse this data into a CSV file, the most pertinent information would be the 'description' section and the 'result' section. It will take some research but it shouldn't be more than a few lines of code. THanks for the response regarding parsing the data into a CSV, how would that happen? I'm only seeing 31 standard statements in Learning Locker to report on. Do you have ideas / recommendations on HOW to pull the description and result section out of Learning Locker? It's obviously stored there, just not sure how to report on it / pull the data.